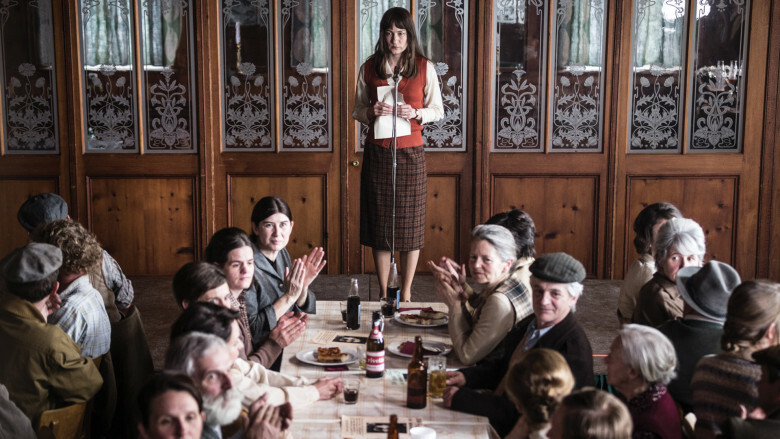 Petra Biondina Volpe’s newest political comedy-drama, The Divine Order, is a view into the late-to-the-party Swiss women’s rights movement of the 1970s. Opening with real images from the cultural and sexual revolution of the late 60s in the USA, the film’s optimistic anticipation is quickly undercut by a quiet shot of the film’s setting: a small rural village in Switzerland which is the home of the story’s protagonist, Nora, portrayed with confidence by the wonderful Marie Leuenberger. Clad in clean snow and mountainous backgrounds, the backdrop of this Swiss entry for the Best Foreign Language Film at the 90th Academy Awards serves as a serene and calm contrast to the chaos of the plot of social reform. It’s 1971, and there is a referendum on whether or not to grant women the right to vote in federal elections. Nora is a complacent housewife whose only commitments are to the men in her life: her husband, Hans, her two young sons, and to her verbally abusive and traditionalist father-in-law. She has a strong maternal bond to her rebellious niece who develops an interest in a life that extends beyond the small farm on which her family lives, out to her long-haired, leather jacket wearing boyfriend. Previously stating that she “doesn’t want to be liberated” when approached by a female activist on the street, Nora’s submission is challenged when her niece is sent to an institution for disobedient young women. This serves as a catalyst for Nora to become involved in the fight for women’s suffrage. Teaming up with an elderly friend, Vroni and an Italian immigrant, Graziella, Nora embarks on a transition into modernity which begins with a truly 70s haircut, and leads her and her new comrades to a demonstration in Zurich where they learn the intricacies of female anatomy and even attend a disco for the first time. Disgruntled by Nora’s newfound attitude and desire to go back to work (something she cannot do without her husband’s permission), Hans insists that she remembers her place as a carer for the men in her life. The other women in the village face similar adversity in their homes and collectively decide to go on strike and keep under wraps in Graziella’s pizzeria, whilst their husbands and sons explore the world of housework and cooking for the first time in their lives. This film will screen at the GFT from the 9th to the 15th of March. Tickets available here.